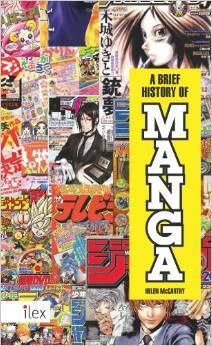 "A Brief History of Manga" by Helen McCarthy is a wee, hardback, glossy book. It gives a pretty good overview of manga, starting from about 700AD! Okay, that bit's really, really brief. Two pages along, I discovered that some British people published newspapers in Japan during the 1860s, which included cartoons. Most of the book is about manga in the 20th century, linking some of the manga developments to periods of history. I really liked the little timelines along the bottom of each page, and the colour pictures showing the different manga mentioned in the text. I also enjoyed seeing how the drawing styles changed as time went on. I've got some ideas for manga to try now too! McCarthy has written other books, and one of them is in my classroom (the Hayao Miyazaki book). She's a good writer and doesn't make things too complicated. Kodomomuke (子供向け): children (less than 10 years old. "Doraemon" and "Hello Kitty" are for children, and try to teach them moral values while reading sometimes wild and wacky adventures. Shoujo (少女): young girls (aged from 10-18). Examples are "Sailor Moon", "Ouran High School Host Club" and "Fushigi Yugi". There tends to be a lot of romance, though adventures can, and do, happen. Shounen (少年): boys under the age of 15. The main character tends to be a boy and there's a lot of action and fighting. Shounen manga include "Naruto", "Bleach" and "Attack on Titan". Seinen (青年): males from 15 up. Like josei, seinen is getting darker, maybe psychological, and the themes are more mature. Examples are "Mushishi", "xxxHolic", and "Hellsing". Personally, I like manga from all the gender and age ranges so I don't tend to be worried about whether the manga I'm reading is too "manly" or "girly". I like what I like. However, when I'm looking for a new manga to try, I might do a google search for josei, if that's what I happen to be in the mood for. Mostly Miss Ferguson, maybe some pupils?